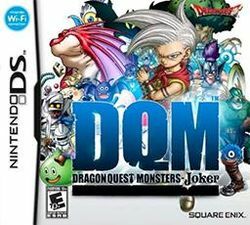 Dragon Quest Monsters: Joker (ドラゴンクエストモンスターズ ジョーカー, Doragon Kuesuto Monsutāzu Yōkā) is a Nintendo DS role-playing game published by Square Enix, and is the latest installment of the Dragon Quest Monsters series. Square Enix released the game on December 28, 2006 in Japan and in North America on November 6, 2007. This is the first game in the series to have online play, via Nintendo Wi-Fi. Like the other games in the series, the character and monster designs are credited to long-time Dragon Quest series artist, Akira Toriyama. The story is about a young boy who as been ordered by his father to spy on the monster scout competition. Ultimately, he finds that Commissioner Snap has become obsessed by the idea of turning all humans into monsters with the mutagenic properties of Darkonium Crystals, explaining why said crystals were integrated into the Monster Scout Challenge. He then proceeds to turn into the powerhouse monster, Dr. Snapped, and a fight between them ensues where player is forced to fight him and his two cronies, who are monsters as well.